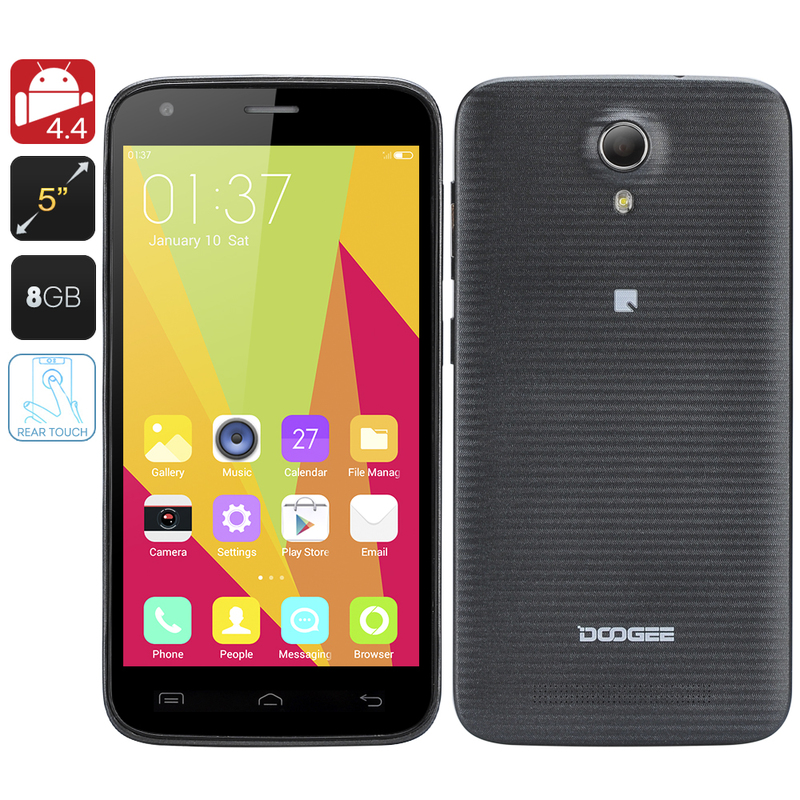 Successfully Added DOOGEE Valencia 2 Y100 - Octa Core MT6592 CPU, 1GB RAM, 5 Inch Gorilla Glass IPS Screen, Android 4.4, 8GB Memory (Black) to your Shopping Cart. The DOOGEE Valencia 2 Y100 is a modern Smartphone, the Y stands for youth and it has be designed for the fashion conscious youthful consumers of today with innovative features. The phone comes with a simple black rear cover however this is just one of the 6 interchangeable back panels that are available, additional covers can be white, green yellow, blue or red and these soft pastel colors are influenced, of course from the Spanish city of Valencia, that this phone is named after. This city of arts, as its know, not only lends inspiration for the colorful cases and artistic design but also for the innovative technology that is seen inside. Each rear cover has a back touch panel that comes in helpful for all types of actions; whether it be web browsing or taking a selfie it’s easy and convenient with one hand thanks to this helpful panel. With a carefully textured design the back panel of this phone is easy to grip letting you keep a firm hold of it. When it comes to snapping photos a 8MP front facing camera offers plenty of selfie action and the 13MP rear camera is great for any kind of shot with its wide angle lens and F2.0 aperture. Letting you capture some truly artistic offerings. Another major feature of this phone is its ability to recharge ultra fast. The Valencia 2 Y100 has a Fast Charge Mode that enables its 2200mAh battery to reach 70% of charge in less than half an hour. That's a real blessing in a world when we find it hard to put down our phones. As even the most hectic schedules can find a mere 30 minutes to stop for a recharge. The side of this phone has three LED’s that can instantly notify you of a missed call or message and let you check your phone at a glance without even having to unlock the screen making for a reliable and discreet reminders of what’s new. Adopting a conventional 5 Inch screen design the Valencia 2 Y100 fins the balance between function and form letting you enjoy easy usage while being large enough to show games, photos and movies in stunning 1280x720 resolutions. Corning Gorilla Glass protection offers great durability keeping the screen looking better for longer and ensuring its not easily scratched by keys or accidental drops. With Android 4.4 and a powerful Octa core CPU as well as 1GB or RAM the Valencia 2 offers a smooth performance and highly intuitive system which results in a spectacular phone with loads of goodies to enjoy. This product is in stock now, we offer a 12 months warranty on all our products. Brought to you by the leader in electronic devices as well as wholesale Android phones, Chinavasion.. I am pleased with the quality and price of the product.